The most recent car booking in Ceske Budejovice has been made on our website 3666 minutes ago. In Ceske Budejovice, we offer for rental 4+ car categories from 2+ rental suppliers. OrangeSmile.com combines car offers from absolutely all rental suppliers located in and around Ceske Budejovice. As an aggregating system, in Czechia we are able to provide reduced rental rates that are, in most of the cases, lower than you can get from the suppliers. The search form above allows you to find these offers in Ceske Budejovice on any desired period. You can also specify a return location in Czechia different from the pick-up place. The maximum rental period is 30 days. The cars for rent presented in the search results for Ceske Budejovice are just example models for each specific offer. Unfortunately, for Czechia we are not able to tell in advance which specific car model will be given at the desk. Rare vehicle types, such as convertibles, sports cars, large off-road vehicles or minivans are available in Czechia mostly at airports. If you are looking for such a car type, please check the airports nearest to Ceske Budejovice. We wish the most exciting discoveries while driving around Ceske Budejovice! For more than twenty years Linz has been a permanent venue for the world's biggest festival of street art. Pflasterspektakel Festival takes place in the second half of July. 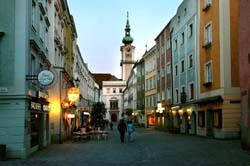 For three days this picturesque city turns into a huge theater stage; Linz drowns in atmosphere of euphoria and fun. The program of the colorful festival is very diverse; street performers, musicians, dancers, poets, acrobats, clowns and artists show their talents to an audience. The main distinguishing feature of the event is that all performances involve an audience directly. Artists are sure to engage gazers, so anyone can shine on the stage during the festival. Theatrical scenes are usually located in the heart of the city; in recent years, at least ten of them were arranged. Therefore, attenders can watch multiple performances. Totally there are about forty venues for performances in Linz, they can be found in virtually every area. The holiday program is planned in such a way that the audience has an opportunity to visit as many interesting events as possible.